In his new role, Matt Harvey allows one run and two hits in two innings of relief. ST. LOUIS — Matt Harvey the reliever so far looks a lot like Matt Harvey the starter. The former Mets ace allowed one run in two innings Tuesday, making his relief debut after being demoted to the bullpen over the weekend. 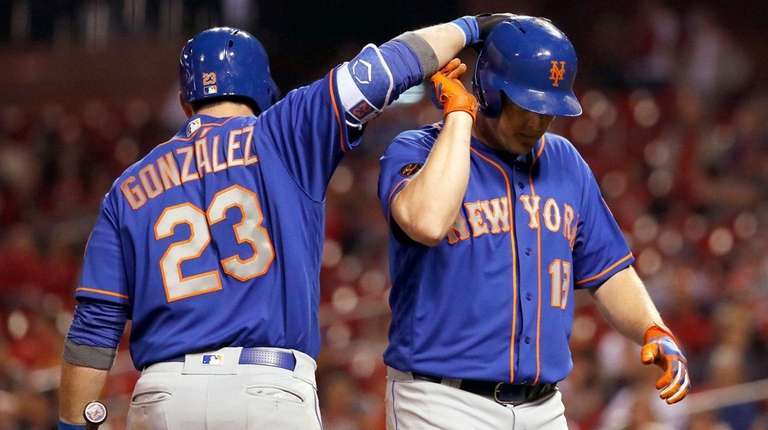 The Mets’ bats picked him up with two late runs for a 6-5, extra-inning win against the Cardinals. The Mets’ slumping outfielders, Yoenis Cespedes and Jay Bruce, each homered. Bruce’s was the winner in the 10th, Cespedes’ a three-run shot into the second deck in leftfield in the fifth. Harvey gave up two hits and a walk, striking out two. He had the fifth and sixth innings, entering what was suddenly a high-leverage situation. He began to warm up as Zack Wheeler struggled through the fourth, and continued to do so when the Mets batted trailing by three runs. When Cespedes’ homer tied it in the fifth, Callaway stuck with Harvey as his first choice out of the bullpen in the bottom of the inning. Callaway said he didn’t consider using anybody else. Harvey retired his first two batters, but consecutive hard-hit doubles from Dexter Fowler and Paul DeJong put the Cardinals ahead. Both hits came on fastballs over the middle of the plate when Harvey was behind in the count. In his second frame, Harvey walked a batter but escaped without allowing another run. Harvey threw 35 pitches (20 strikes) and averaged 94.2 mph with his four-seam fastball. That’s a marginal improvement over his 93-mph average in four starts this month. Harvey refused to speak to reporters after the game. Except for a piggyback start behind Noah Syndergaard last September, the relief appearance was Harvey’s first since Aug. 2, 2009, when he played for the Chatham Anglers of the Cape Cod League after his sophomore season at North Carolina. The run allowed by Harvey was the only one in the bullpen’s six innings. Cespedes finished 1-for-5 with three strikeouts, Bruce 3-for-5. Callaway said before the game that Bruce was “battling,” but Tuesday was different. Cespedes, who maintained his season strikeout rate of more than 40 percent, said recently he has considered taking up golf again in an attempt to break out of his slump. He said Tuesday, though, that that hasn’t happened yet because all eight of his sets of clubs are in Florida. Wheeler got hit hard in the worst of his three major-league starts this season. He lasted four innings, allowing four runs, six hits and two walks. He struck out three. St. Louis scored twice in the first (Tommy Pham, two-run homer to center) and twice in the fourth (Kolten Wong RBI double, Luke Weaver RBI single). Weaver’s hit was the first time this season (43 plate appearances) that an opposing pitcher reached base safely against the Mets. Wheeler gave up seven balls hit faster than 100 mph. Four turned into outs. “Pretty bad,” Wheeler said of his day.